Size: Adult wing span--1 1/2" to 2", larva--1" to 1 1/2"
Identification: Adults are brownish gray moths with silvery spots in the center of each wing. Active at night. Eggs are greenish white, round and laid singly on the upper sides of leaves. 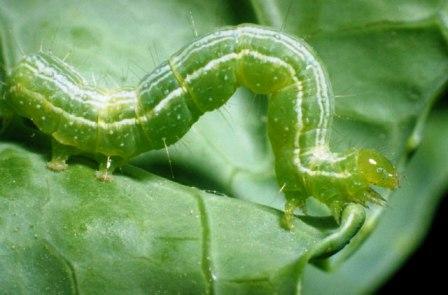 Larvae are green with pale stripes down the back. They form a loop when walking--thus the name. Biology and life cycle: Loopers overwinter as greenish to brownish pupae wrapped with delicate cocoons of white thread. The cocoons are so thin that the pupae outlines can be seen. 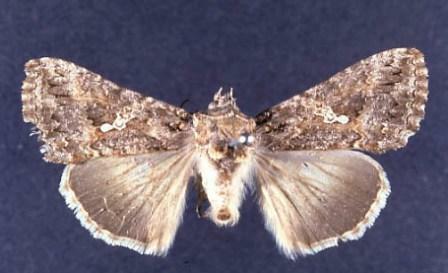 Adult moths emerge in the spring to lay eggs on the surface of leaves. Larvae emerge and feed from two to four weeks and then spin cocoons similar to the ones used to pass the winter. Three to four generations per year or more. The number of worms increases with each generation. Complete metamorphosis. 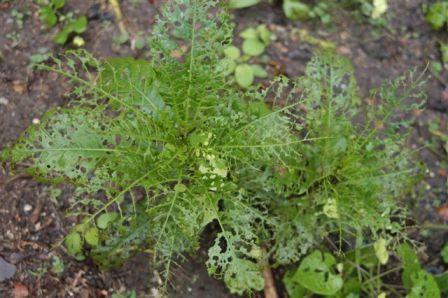 Habitat: Vegetable gardens, especially those with brassicas. Enjoy cabbage, broccoli, celery, kale, parsley, peas, potatoes, cauliflower, brussels sprouts, lettuce, beans, radishes, tomatoes, and other garden crops. Feeding habits: Larvae eat lots of holes in green leaves. Economic importance: Destruction of food crop foliage. Natural control: Trichogramma wasps, birds, paper wasps, and yellow jackets. Loopers are usually controlled by natural diseases and parasites; these function effectively only in an organic program. Organic control: Bt (Bacillus thuringiensis) products. Insight: Even the organiphobes recommend Bt because the chemical poisons don't work on this animal. Here is a quote from a 1962 college text: "The looper caterpillars are often almost completely destroyed, usually late in the season, by a wilt disease which causes their bodies to rot." Bacillus thuringiensis was the wilt pathogen, but not yet discovered, named, and made available to gardeners.